If you liked this post or want to save it for later, please pin it to Pinterest! Small spaces can be tricky to decorate. You have to hit the right balance of items in the room for it to work. Too little and the room might not function as you want it to and if you throw too many things in there it’ll look cluttered. 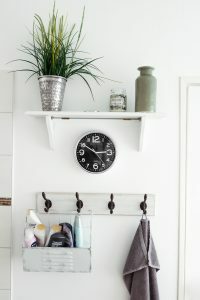 So if you have one of those frustratingly cramped spaces that you want to clean up, don’t feel like you need to sell your place and move onto better places. 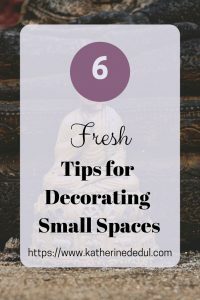 You can make simple changes to your space and create some breathing room. The main part of this article will be about your indoor spaces, places like a living room, bedroom, even a bathroom. 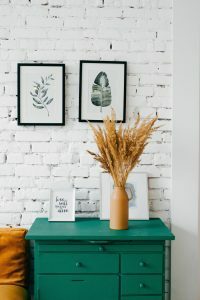 Indoor spaces are the primary concern when you’re in a small space, since that’s where the majority of your “living” is done. 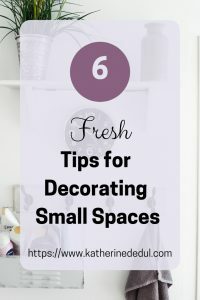 Whether it’s a living room, bathroom, kitchen, or bedroom cramping your style, keep reading for some new ideas to make your small space workable. One super easy and cool trick to instantly add the illusion of space is to simply hang your drapes higher. Start with your curtain rod as close to the ceiling as you can manage. It immediately creates the illusion of high ceilings and more space! Same goes in the bathroom. If you’ve got a small bathroom with a tub, hang the shower curtain as high as you can to create the feeling that there’s more space. If your curtain itself is too short, add additional fabric to the bottom or look for a longer shower curtain at inexpensive stores or online. Dark colors can overwhelm a small space and make you feel like the walls are closing in on you. Picking a light neutral color can create the illusion of space. You don’t have to go white or off-white. A pastel color or a light shade of grey will work just as well. I personally love a cool dove grey because I find it goes with everything I own. Clever storage ideas can absolutely create space by storing away clutter. Think under-the-bed storage options or shelving that pulls your items upward and leaves you with some floor space. Other storage ideas include finding tables that also have storage space underneath. Another great idea is storage ottomans. They can function as a table, a footrest, a seat, and storage, all in one compact little package! 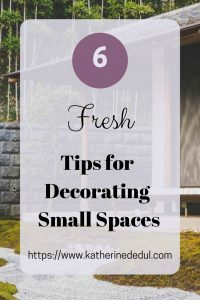 If you have a little balcony or just a small plot of land that your house sits on, you can still maximize the use of small outdoor spaces and enjoy it. The Horticult came up with this brilliant idea to turn your plain old clay pots into a vertical garden, which is perfect for small gardens or balconies because it doesn’t use a lot of horizontal space. Water features add a lovely ambiance to your backyard, and you can find smaller ones that won’t overwhelm your space. 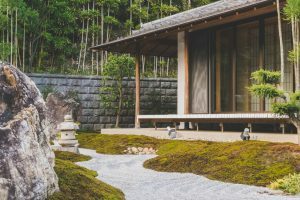 Even cooler, Fix.com has a tutorial on how to make your own water garden, complete with plants and even fish if you like. You can add some separation in a yard with borders. You just have to dig a trench and find some rocks (either purchased or gathered on your own) to great a natural-looking border to your planting spaces and your pathways. 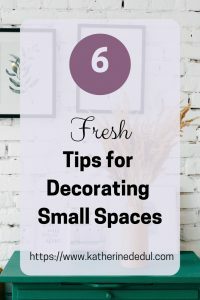 Having small spaces in your home can be seen as a curse, but honestly, with a bit of strategic decorating, a small space can be a blessing instead. 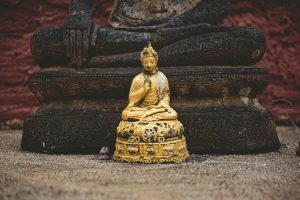 I hope this article helped inspire you and if it did, I would love to hear from you in the comments down below. And if you love it, why not share it with a friend who’s dealing with small space issues?